Hello, Ideas for the Home by Kenarry™ friends! 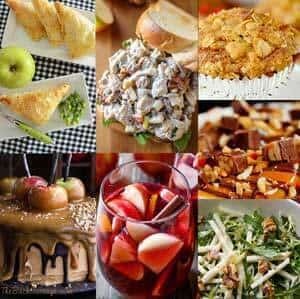 I’m Pam from The Birch Cottage and I’m back for the fabulously wonderful month of October to share another DIY project with you. In case you weren’t aware, it’s fall! I love fall. I love the cool, crisp air. I love the warm colors of the fall foliage and the rustling of leaves underfoot. I love the smell of backyard fire pits and roasting marshmallows. I love the jack-o-lanterns, trick-or-treaters and all the seasonal decor. 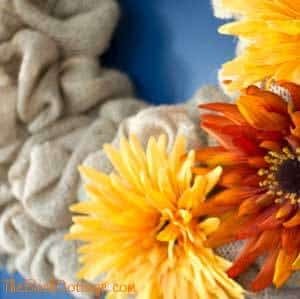 In keeping with that love-of-fall mood I seem to be in, I thought I’d share with you a really easy DIY Fall Burlap Floral Centerpiece. It’s no secret that Carrie and I share a love for all things burlap. 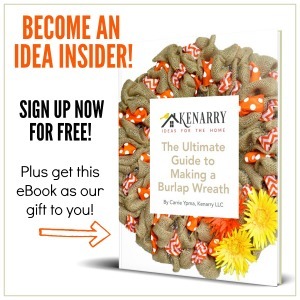 In fact, I’ve previously shared my Easy Sew Burlap Placemats tutorial here on Kenarry. 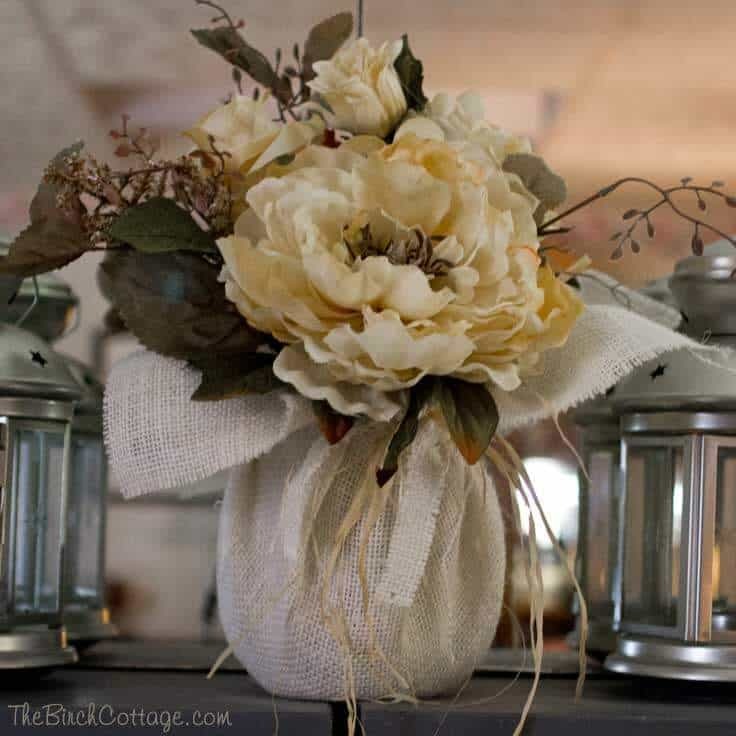 I’m always looking for little ways to incorporate burlap into my home decor. I, however, got this little piece of inspiration from a candle. You know, those big jars of candles. You burn the candle and then you get down to a small little piece of wax that can’t be burned. So, you throw the jar away, right? Wrong! Here’s the secret, you simply put the jar in the freezer. Once the wax has had time to freeze, you can use a butter knife to pry it loose and pop it right out of the jar. Presto! Just like that, you simply wash your jar and you have a nice empty vase. 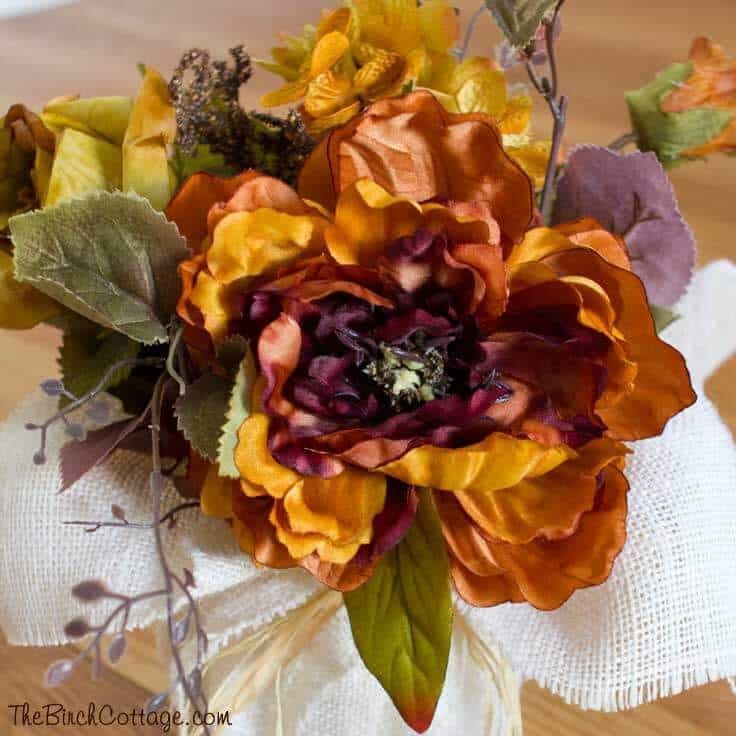 Perfect for a DIY Fall Burlap Floral Centerpiece! 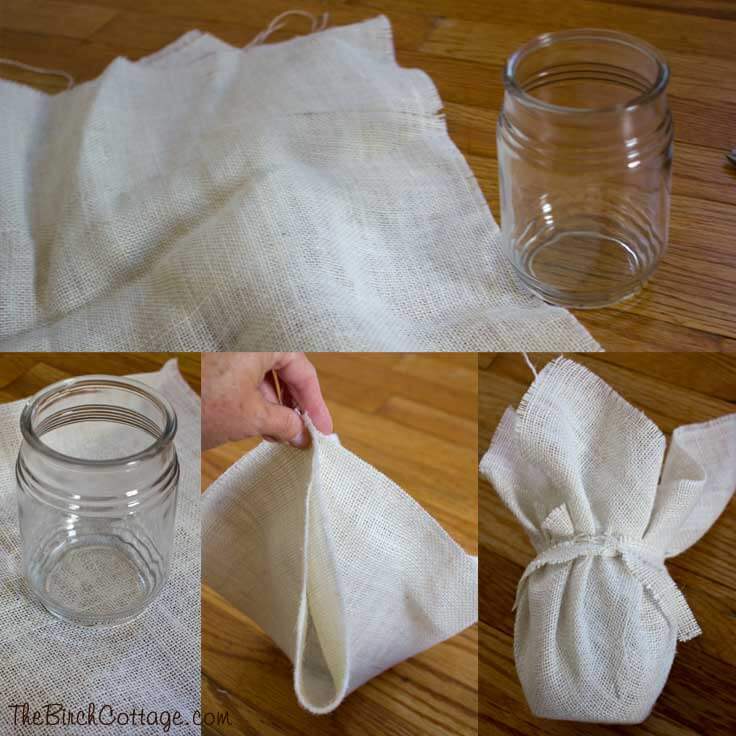 So, now that you have repurposed your candle jar, you simply cut a square of burlap long enough and wide enough so that the corners extend several inches past the vase. There’s a really easy way to cut burlap so you have nice straight edges. 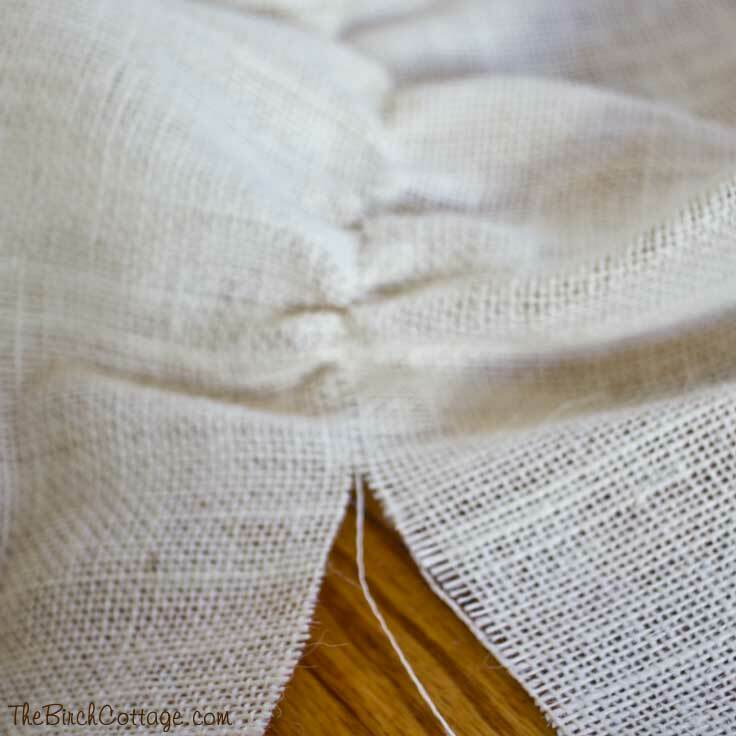 Once you have measured where you want to cut, simply make a small snip on both sides of one of the string and pull the string out of the fabric. This will leave a nice wide guide for you to cut a straight line. Next you’ll want to lay out your square of burlap and place your vase in the center of the burlap. 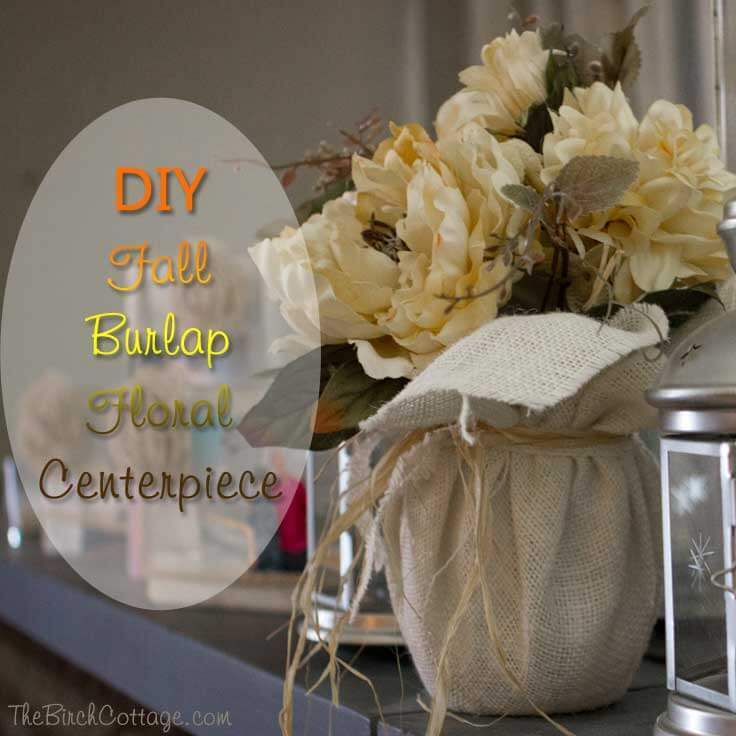 Gather all four corners of the burlap at the top of the vase. 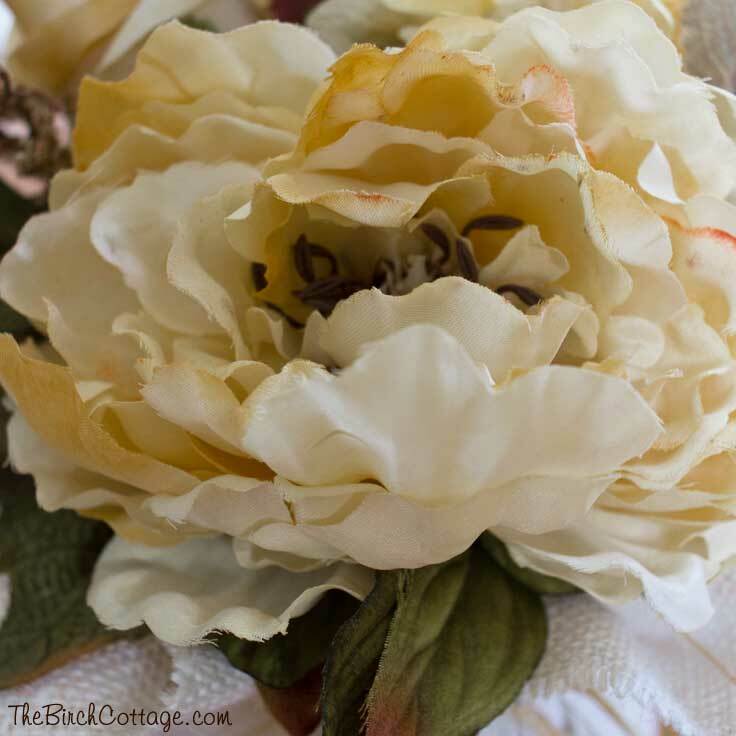 Gather the burlap around the vase and tie a strip of burlap, twine or ribbon around the top of the vase to secure the burlap in place. 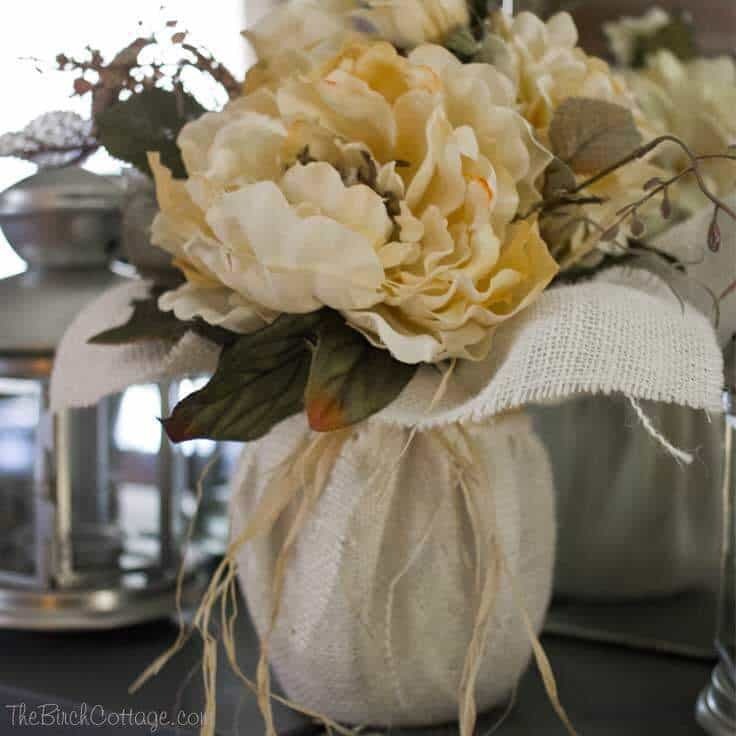 Once you have your burlap secured around the vase, you’re ready to fill your vase with flowers. I found a couple of fall bouquets at Hobby Lobby and simply filled each vase with one of the bouquets. I couldn’t decide if I liked the creamy floral bouquet or this lovely deep fall colored bouquet, so I bought both. 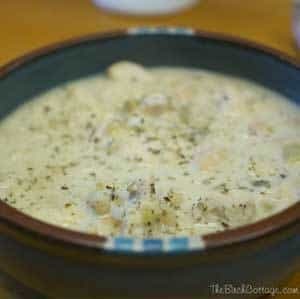 Here’s a closer look at the creamy bouquet. I just think it’s dreamy. And this deep fall-colored bouquet? Perfectly fitting for fall decor. 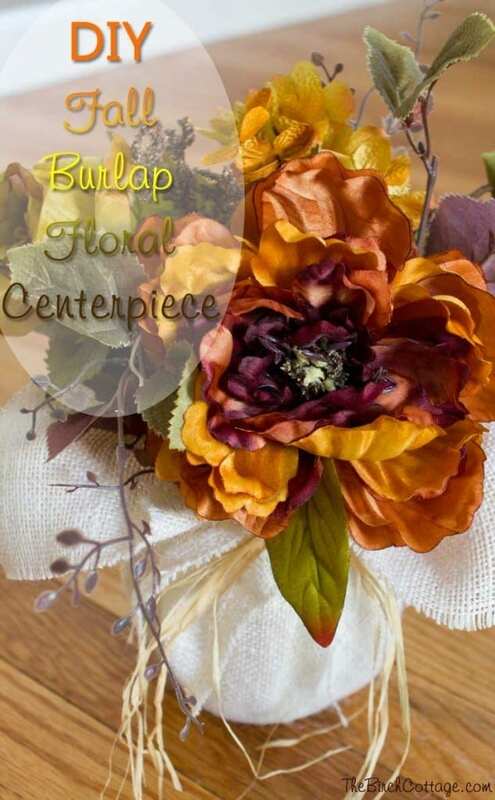 I hope you’ve enjoyed this little DIY Fall Burlap Floral Centerpiece tutorial. Maybe it will inspire you to save those used candle jars! 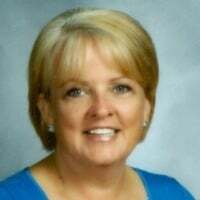 A special thank you to Carrie for allowing me to share this project with you and a truly heartfelt thank you to each of you inviting me into your homes through this blog.